Lemon eucalyptus oil is used in Ayurvedic treatment for asthma, cold, cough, arthritis, hypertension, shingles, migraine pain, rheumatism, wounds, inflammation, bacterial and fungal infections as well as a non-toxic insect repellent for keeping away from mosquitoes, ticks and fleas. Lemon eucalyptus or Citriodora is a type of Eucalyptus tree in the Eucalyptus genus. This tree is indigenous to north eastern and tropical parts of Australia but few sources state that it is native to Vietnam and Madagascar. Even today about 75% of the trees grown in Australia belongs to the Eucalyptus family. Citriodora has its remedial history of being used in the traditional as well as modern medicine in the east and west, mainly as an aid for respiratory infections and for keeping insects at bay. The infusion made from the leaves of this tree has been used in reducing fever, treating gastric conditions and fighting against microbes causing such infectious diseases in the Aboriginal tradition. Ayurveda and the Traditional Chinese Medicine (TCM) used the aromatic leaves of this plant in steam inhalation for clearing nasal congestion, easing cold, flu, asthma and sore throat. The paste of this leaves or the leaves poultice were also used in healing wounds, cuts, skin infections, sores, cuts, blisters, chicken pox, joint pain, rheumatic pain, fungal infections and other few other infections. Lemon eucalyptus oil is a famous ingredient in soaps, aromatic candles, natural insect repellents, lotions, shampoo, toothpastes, deodorants, perfumes, detergents, insecticides, waxes and in the flavoring of few other products since the traditional times. The medicinal benefits of Lemon eucalyptus oil are often attributed to its high content of citronellal component (about 80%). The other chemical constituents include citronellol and other monoterpenes. The citronellal constituent of the cultured oil is transformed into cis- and trans- isomers of p-menthane-3,8-diols (PMD), which is a natural process that happens as the Eucalyptus leaves grow old. This oil is also called by other names like Para-menthane-3,8-diol, OLE, PMD, P-menthane Diol, Wild Eucalyptus Citriodora, P-menthane-3,8-Diol, Spotted Gum and Quwenling. The therapeutic properties of this oil are calmative, insecticide, antibacterial, expectorant, diuretic, analgesic, fungicidal, antimicrobial, antiviral, anti-rheumatic, germicidal, anti-inflammatory, disinfectant and antiseptic. 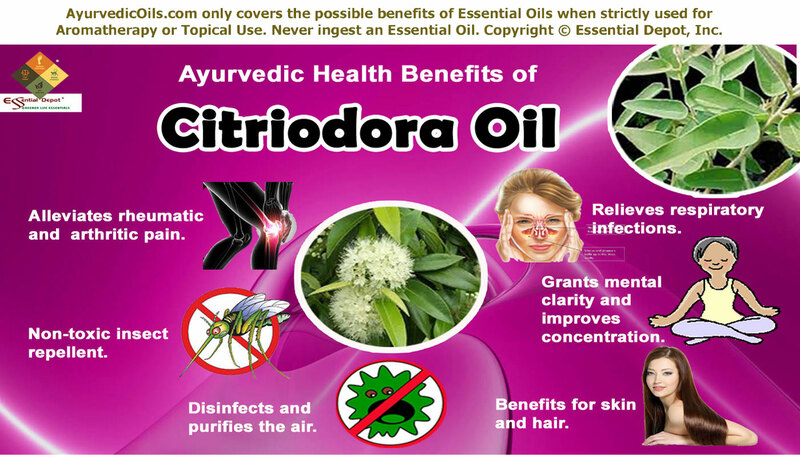 Ayurvedic health benefits of Citriodora essential oil: Ayurveda is the ancient Indian healing methodology which exactly means ‘the knowledge of life (Ayur-life + Veda-knowledge)’. If you are completely new to this oldest healing science on earth, then join for a wonder ride where you can explore what Ayurveda has intact for you. Ayurveda has thousands of dimensions and everything that is natural and organic falls into this bucket, as Ayurvedic principles abide by Mother Nature and strongly believe that everything in the universe is a part of nature and is built with the same five elements of nature, namely earth, fire, air, water and space. The most imperative approaches of the Ayurvedic regime are holistic approach, which fervently states that health is a combination of the wellness of the body, psyche and the soul. This is clearly stated in Charaka Samhita, the most trusted Ayurvedic encyclopedia as “The three – body, psyche, and soul – act as a tripod. The world stands upon them, and within them, the world abides.” Ayurveda trusts that a healthy body is the absolute home for a healthy mind and a pure soul. Spiritual aspects play a vital role in Ayurvedic healing. It has been said a small, sincere prayer can bring in enormous positive energy to deal with a difficult day. Spirituality simply means the trust and the natural bond with the Supreme Power that shells and leads the Cosmos. By inculcating this practice, every individual will understand his responsibilities and righteousness to lead a glorious life. Ayurvedic philosophies bring in the other few vital practices of Ayurveda that includes prevention of illnesses by treating the root cause of a disease instead of the symptoms. Prescribing natural remedies like herbs, essential oils, meditation, yoga, prayer and a meaningful Ayurvedic routine is the key to this healing wisdom. By this way, it promotes a disease-free living and leads to healthy aging and longevity. Every Ayurvedic treatment starts with the analysis of the dynamic biological energies that are a pictogram of the five natural elements. They are known as doshas, namely pitta (fire + water), vata (air + space) and kapha (earth + water). These three energies are there in every person in unique ratios to make up the individual constitution. Balance between these doshas indicates health and imbalance leads to sickness. Ayurvedic therapies are prescribed in such a way that they treat the doshic imbalances and help strike absolute balance according to the Prakriti (fundamental constitution or nature) of an individual. With its moisturizing and heating energy, Citriodora essential oil is known to lessen the excess of kapha and vata energy and increase pitta dosha when deficit. Citriodora essential oil treats kapha surplus and regulates its flow in the system. Massaging the affected parts with 5 drops of Citriodora oil blended with 2.5 ml of coconut oil can help in eliminating the excess deposits and toxins through sweat and urine and enhances blood circulation. This massaging can also help in treating sore muscles, joint pain, and backache and can also serve as a vitalizing massage for people indulged in sports. This oil relieves pain and reduces swelling with its heating effect along with its analgesic and anti-inflammatory properties. Adding 2 drops of Citriodora oil in warm bathing water or in hot or cold compress is also another alternative to treat arthritic and rheumatic pain. Performing Pranayama, the art of balanced breathing can help in discharging about 70% of the toxins in the body through exhalation. The essential oil of Eucalyptus citriodora is suggested by the FDA (Food and Drug Administration, U.S) as a non-toxic alternate for DEET, which an element used in other repellants, making it unsafe. With a rosy-citronella fragrance and faint lemon undertones, Citriodora essential oil is an ultimate natural remedy for keeping away from harmful insects including mosquitoes, bugs, ticks and fleas. Citriodora essential oil has kapha-reducing properties along with the antiviral and antimicrobial properties that assist in destroying the harmful virus and microbes responsible for making respiratory infections vulnerable. 2 to 3 drops of this oil added to hot water for steam inhalation helps in loosening the phlegm and mucous deposits. By this way it helps in relieving chest congestion, nasal congestion, cough, bronchitis, asthma, sore throat and cold. Adding 2 drops of Lemon eucalyptus oil to your decongesting ointment and gently rubbing on your chest, back and throat can fasten your healing process. Pitta energy is responsible for body temperature, metabolic functions, decision-making potential and for instilling the feelings of perfection in your routine. Deficit of pitta energy or pitta imbalance along with other environmental and lifestyle factors can end up in chaos, poor concentration, sluggishness, lack of self-confidence, lonesomeness and distress. Eucalyptus citriodora oil enhances pitta energy. It has a positive effect and supports in opening the heart chakra, which is responsible for forgiveness, compassion, love for self and others and the solar plexus chakra that is incharge for feelings of self-empowerment and self-esteem. Adding 3 drops of Citriodora oil in your burner, vaporizer, diffuser or air freshener can help in improving your self-confidence, focus, shrewdness and clarity of thoughts with its fresh, citrusy, warming, camphoraceous and woody aroma. Massaging your body with 10 drops of Citriodora oil mixed with 5 ml of olive oil or adding 3 drops of this oil to your bath can help in rejuvenating the mind, body and the soul. A 2002 study on ‘Correlation between chemical composition and antibacterial activity of essential oils of some aromatic medicinal plants growing in the Democratic Republic of Congo’ by the Department of Pharmaceutical Sciences, Belgium published that Eucalyptus citriodora is one among the most effective essential oils exhibiting the most active antibacterial effects and inhibited the growth of various bacteria. As a potent antifungal oil, Citriodora has been proved effective in treating candida. When tested in a laboratory analysis in comparison with other essential oils possessing synthetic antibiotics against candida, Eucalyptus citriodora oil showed strongest anti-candidal properties. 5 drops of Citriodora oil blended with 3 ml of Almond oil and applied to infectious wounds, cuts, blisters, boils, ringworm, candida, athlete’s foot, rashes and redness due to insect stings and bites, acne and few other skin conditions with its eucalyptus and citrusy effects. 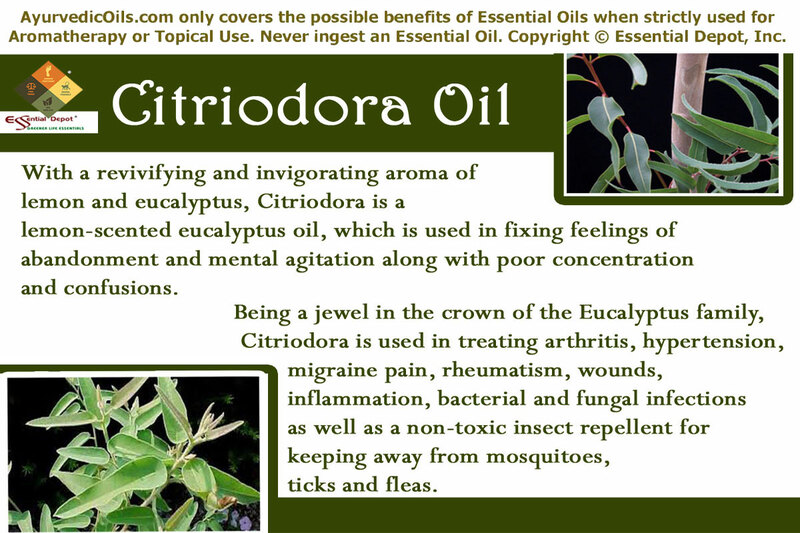 Eucalyptus citriodora oil is also a famous ingredient in shampoos, hair oils and few other hair care formulas. 10 drops of Citriodora oil added to 5 ml of coconut oil can serve as an assured remedy for alleviating dandruff, dry scalp, itching and lice, when massaged gently on the scalp followed by a hair wash with a mild shampoo (preferably 8 ml) mixed with 10 drops of Citriodora oil will leave you with a dandruff-free, lice-free, oil-free and clean smelling hair. This article is for the purpose of education only and is not meant for curing, preventing or diagnosing any health condition or for substituting any prescribed medication or professional advice of your medical expert. Do not use essential oils internally and always dilute essential oils before using it externally. Keep out of reach of children and avoid this oil if you are pregnant or a nursing mom. Ensure that you seek the advice of your Ayurvedic practitioner or healthcare expert before selecting the appropriate essential oil for your unique state of health and individual constitution. This entry was posted in Essential Oils - Learn About and Purchase and tagged Ayurvedic health benefits of Citriodora oil, Ayurvedic insect repellents, Ayurvedic oils for acne, Ayurvedic oils for arthritis, Ayurvedic oils for asthma, Ayurvedic oils for bacterial infections, Ayurvedic oils for candida, Ayurvedic oils for mental clarity, Ayurvedic oils for poor concentration, Ayurvedic oils for rheumatism, Ayurvedic remedies for dandruff, Ayurvedic remedies for inflammation, Ayurvedic remedies for respiratory problems, Ayurvedic remedies for self-empowerment, Chemical constituents of Citriodora oil, Citriodora oil in Ayurveda, Eucalyptus citriodora, Eucalyptus oil, Health benefits of Citriodora essential oil, Lemon eucalyptus essential oil, Lemon-scented gum, Natural disinfectants, Natural insect repellents, Pranayama for rheumatism, Therapeutic properties of Citriodora oil by AyurvedicOils. Bookmark the permalink.